What to expect with your new Min Pin? 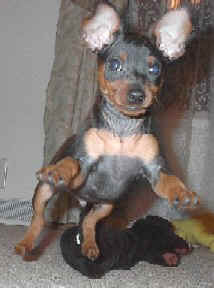 Miniature Pinschers are without a doubt a breed of dog that not everyone is cut out to own. Many will advise that a first time dog owner not start out with this breed for many reasons. Min Pins like to take a look at all the rules, break them, throw them out the window and do as they please. Their cat like abilities, fast reflexes, jumping talents and their astonishing talent to think things through make them a challenge to own even for the most experienced dog owner. They have a fun-loving personality that doesn’t stop and an energy level that is unmatched by any other toy-breed. They can be extremely curious and will go to any length to go nose-to-nose with something that has captured their attention. I did say they would go to any length! Cruzer: photo donated by Laurie S.
Min Pins have been known to open cabinet doors, climb onto kitchen tables, and explore counter tops in search for anything they shouldn’t have. Staying one step ahead of a min pin is a full time job that many find they are not capable of. Miniature Pinschers require extensive work in socializing to avoid being scared or wary of strangers, they need firm but loving training that is done with positive reinforcement and a stable home full of attention and entertainment. 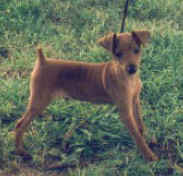 Min Pins can be very stubborn, but at the same time love training and pleasing you. Min Pins are very loyal; don’t be surprised that even though your min pin shows affection to all members of your family they often will pick one member to bond strongly with. Chibi; owned by Janet S.
Kaiser; Owned by Kelly G.
Before your Puppy comes home. Several days before you pick up your puppy you must get your home and family members ready for the big arrival. You need to have all of your puppy supplies purchased before he comes home. 9) Small supply of food recommended by your breeder. 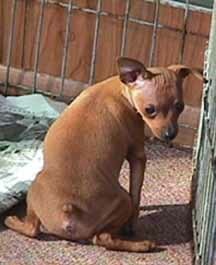 With your families help, Min Pin Proof your home. That may sound funny now, but this is valuable information that may later save the life of your ever-exploring young min pin. Yes, you are about to enter the world of being owned by a Min Pin and the more prepared you are for this the easier and safer it will be for everyone. Much like Baby-proofing your home, you need to take a look at your house from the Min Pin's eye level. Make sure power cords are safely out of reach, garbage can is safely secured or shut up behind a cabinet, pantry, etc. Make sure your bottom cabinets can't be pulled open and all cleaners, insecticides and other harmful chemicals are safely locked up or put out of reach. Min Pins have been known to pull open cabinets, get on kitchen tables and occasionally counters. If you have children, talk to them about the importance of not leaving toys down that they don't want chewed or can be swallowed and choke your puppy. Get into the practice of keeping the toilet lid down at all times. A young dog/puppy can fall into a toilet and drown in search of water even when they have bowl of clean water handy. There is something about toilet water many dogs just can't seem to resist. Lock up your shoes and other personal items that a puppy will chew. Magazine racks or newspapers that are left within reach as well as books are considered fair game and a min pins favorite. Now is the time to start purchasing your housebreaking tools, many start out using Potty Pads which can be purchased at nearly any department store. Also needed are grooming supplies, a collar or harness, a leash, a bed or crate, blankets for crate. Min Pins tend to love to have a place of their own which having a crate supplies them; crates are also used as a wonderful housebreaking tool. If you have a fenced in yard you need to do a careful inspection for holes or gaps in the fence that your new min pin can escape from. Don't under estimate the small size needed to allow for freedom. Talk to your breeder about the food that he/she uses, you will want at least a small supply of the same food even if that isn't the food you plan on keeping him on long term. A slow adjustment from what he is eating to what you wish to purchase is needed to avoid tummy upset. Your breeder will most likely supply you with a small amount, but have some on hand just in case. Now is the time to find a veterinarian if you don't already have one. Remember, your breeder will strongly suggest a check up for your new puppy be made within 48-72 hours after they are brought home. In most cases everything with your new puppy is just fine, but you need to be sure. Not to mention this is a wonderful time to get to meet your veterinarian and get even more suggestions on making the transitions for your new puppy easier. A vaccination schedule will probably be set up for you at this first vet visit, you also need to discuss with your vet his/her recommended age to neuter your puppy. The younger they are when this is done the better it is for everyone. Although many think that a puppy is ready for his new life at the young age of six weeks, it has long since been proven that all puppies of any breed should never be removed from his mother and litter mates before the age of eight weeks and waiting until they are ten to twelve weeks is even more beneficial. Puppies need this time with their Mother and littermates to learn many things that only living in this environment can supply them. You will have a happier, well-adjusted pet when he is given this extra time with his family and breeder. Between the ages of five and seven weeks puppies start to socialize within the litter and with people. Training by the mother is taking place with the puppies and during this time they are learning the difference between socializing with other dogs and socializing with people. Only when a puppy is allowed to remain with the litter are they able to do this. During this time your puppy will learn about pack hierarchy, bite inhibition and proper social behavior within the pack. Taking a puppy home before 7-1/2 to 8 weeks of age really deprives the puppy of much needed training by mom and littermates and will make your job of training much more difficult. A few days prior to the day you bring your puppy home, take a couple of towels or small blankets to your breeder’s house that can be added to the mothers bedding. The scent of the mother dog will help comfort your puppy once you have him home. Those first few nights can be long and scary to a puppy that is away from his Mother and littermates for the first time. When you pick up your puppy, head straight home with him. Keep him warm and snuggled close wrapped up in one of the towels that have his mothers scent. Resist any urges to stop by to visit family and friends. You will have many years to introduce them to your new baby. If you do not live in the same area as your breeder, bring along a couple of empty milk jugs and ask the breeder to fill them with tap water. You may think there is no difference between your water and what your puppy is accustomed to, but your new puppy will know. Each time you give your puppy water, do so using a small bowl, water from the milk jug and refill the milk jug at once with your own tap water. In time your puppy will be switched to your drinking water without causing any stomach upset. The first few days are crucial in how your puppy will adjust and interact with your family later on. These days should be fairly quiet while the puppy is allowed to adjust to his new surroundings. Always be there to offer comfort and pay close attention to your puppy during this time. You want to establish now a bond between you and your puppy that will last for many years to come. Do not place your puppy on a couch, chair, or bed unattended. A fall from that distance can dislocate or break bones. Allow your puppy to explore freely his new surroundings being sure that you show him where his food and water are. If he wants water, allow him to drink freely. A potty schedule should be started at once and it’s important to stick to that schedule. Usually a puppy will need to relieve himself a few minutes after eating and at least every hour after that. Each puppy will be different, so watch him closely. Correct mistakes quickly and praise often for a job well done. Do not deviate from your housebreaking rules, you can’t allow a potty accident to be OK one time and not accepted the next. This will confuse your puppy and greatly lengthen your training time. The key to housebreaking is to be patient, be consistent, and stay positive. They'll get the hang of it. The first few nights can be quite an adventure. Your new puppy is scared and lonely and will most likely whine out of fear. Make sure your puppy is in a crate in a warm draft free area. Placing some small stuffed animals in the crate with him along with the towel you brought home from the breeder will help add some needed comfort. A ticking alarm clock or a radio playing softly can also sometimes help. It’s going to be hard, but resist the urge to run to his aid if he starts to whine, it’s to be expected and unless this is an urgent painful howling he should be left alone. Running to him now will only enforce the idea that he is now in charge and a yelp from him will bring you running to his aid. You must always remember that you are in control but a min pin has a wonderful talent for shifting that control to him without you even being aware that it has happened. You can expect these restless nights to last about a week but many times a baby will get accustomed much sooner than that. 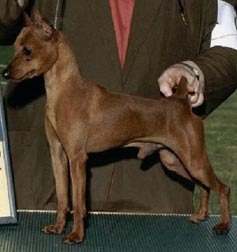 When your homework is done and you know how to find a Wonderful breeder that has put as much time and love into their puppies as you will do for your puppy for the next several years to come; your time with your Miniature Pinscher will be a time filled with wonderment, love and constant support from your puppies Breeder. Above Right: CH. Veroma's Ledgends Of The Fall, still known at home as Tristian.